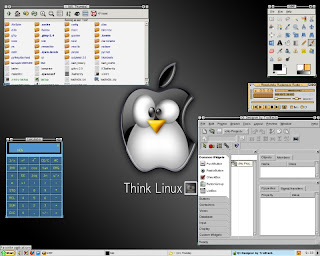 An Absolute Linux Review: Absolute Linux is a stripped-down version of Slackware. It is made for speed, stability, security, and ease-of-use and development. 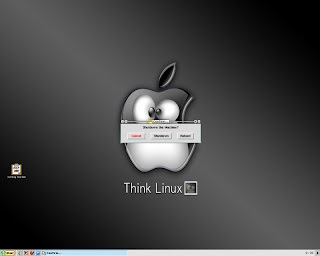 Its chief aim is to make installation and maintenance easier than of the original Slackware. 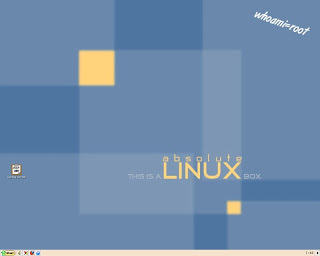 Absolute Linux uses the ultra-lightweight IceWM window manager and ROX for handling files. Currently, my backup computer has Windows XP and Zenwalk 3.0. I was already looking forward to erase my old Linux partition and at the same time try other distros that would fit to replace Zenwalk. Then just recently, I was asked to review Absolute Linux and upon reading some articles and a review about this distro, my curiosity was aroused. And so I downloaded the latest release version, burned it, and this time I installed it directly to the hard drive after saving some of my important files to an external storage device utilizing a Linux backup software, and placing other files on several online backup services. Here is my full adventure and my observation of Absolute Linux 12.0.6. The download site for Absolute can be found here. The installation is not quite for beginners as it is only text-based, but I will give a little walk-through as a guide to those who needed help in installing Absolute. The first part of installation is the boot option prompt. I did not gave any parameter and just pressed enter until I reached the part where I have to choose to start the installation or to perform the other given options. I chose to install by typing ‘setup’ then enter. The setup menu appeared and I started the install by adding swap. The installer appropriately used my old Xubuntu swap and root partition so I didn’t have to do the partitioning. It also detected my Windows partition and gave me an option to mount it. I was also asked to pick what file system to use and I selected ReiserFS. Then, I was again prompted for the location or the media that I would use to install Absolute. I chose to install ‘Absolute from CD’ of course and from there, the installer copied the necessary system files and applications which only took around 10 minutes to complete, followed by a few hardware configuration options and installation of Lilo. I restarted, and at first boot, I was given an option to set a root password and then I let Absolute automatically configure Xorg.conf. I found the installation really successful as my usb, sound, video, and ethernet were configured well. The login menu is text-based by default just like the installation, but it can easily be changed to a simple graphical menu. I logged in to an IceWM desktop and found out that my 17 inch monitor’s screen resolution was highly set to 1600x1200 and 70Hz refresh rate; but then it was easily fixed. There are also plenty of nice themes and wallpapers to choose from. IceWM’s GUI is a little tricky to use at first, but once you are used to it, then you will love it just like I do because of its speed and responsiveness. There’s also an easy option to use Fluxbox window manager but I don’t recommend using it as I bumped into several problems after I tried it. On Absolute Linux, some of the best free and open-source applications are already pre-installed. 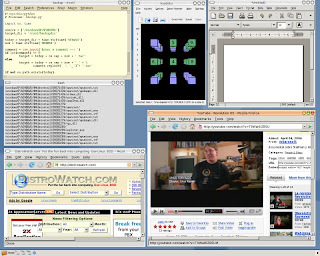 There’s Firefox, Gimp, SMPlayer, Samba, Ktorrent, K3B CD/DVD Burner, Abiword, Qt Designer, some games, and many more. Java Runtime Environment and Flash is also installed by default. For advanced users, you will find a couple of Linux terminal emulators that can be used for automating tasks as well as doing other important stuff. Plus, managing software is a lot easier thanks to its GUIs called Gslapt and XPKGTool. I consider Absolute Linux stable enough for daily desktop computing. I was impressed by its speed and steadiness even when I opened several key applications simultaneously including a python script I made that did an automatic backup by getting some of my files from Windows, compressed it, and then saved it to the root Linux directory. Though I did encounter some minor bugs, I don’t think that it’s serious enough to greatly affect its overall performance. Absolute Linux 12.0.6.will definitely stay on my hard drive for now, and I will be playing with it within the next few weeks until I can fully decide whether it could stay a lot longer, or not. Based only from my initial tests, I can say that it has the potential to replace my older Zenwalk system. I don’t really consider Absolute Linux newbie-friendly, but all things considered, Absolute Linux is absolutely a worthy distro to watch. Thanks for the wonderful REVIEW. I'm using absolute linux and it really is a great distro. I changed the window manager to Fluxbox, but in Flux I can't find a menu to change back to IceWM. Open ROX, then find the file named .xinitrc then open it as text. Go to the bottom of the file and replace 'startfluxbox' with 'icewm' only (not starticewm) then save. Logout then type 'startx'. Thanks Auza for this review. You wrote you were "impressed by its speed and steadiness"... Do you mean Absolute Linux is even more responsive than Zenwalk, yet considered to be optimized for speed ? According to my benchmarking I found Zenwalk remarkably fast indeed, somewhat more responsive than Arch Linux with same apps and no special tweaking... I would be curious to known whether Absolute Linux benefits from special optimizations beyond stripping-down Slackware and using lightweight apps ? Based on their performances from my test machine, I would consider Absolute and Zenwalk at par or equal in terms of speed and responsiveness. Beyond stripping down and using lightweight apps, Absolute is easier to maintain and install than the original Slack.